EMS is now offering a complete line of reagents for Histopathology:The highest quality for Fixing, Dehydrating/Clearing and Staining. Prepared from acetic acid glacial with de-ionized water. Blended 95% Ethanol and 5% Methanol. NH4OH F.W. 35.05 CAS #1336-21-6 Specific Gravity: 0.91. Please see the Buffer Section. Bouin's solution can be used as a fixation and a staining fluid. Bouin's fixative is excellent for use on biopsy specimens of the gastrointestinal tract. Tissue from the endocrine system are well fixed and many antibodies react well with tissue fixed in Bouin's. Bouin's solution may be used as a routine fixative or a staining solution, but should not be used as a preservative for tissue. Tissue cannot be held in Bouin's solution for extended periods. The maximum fixation time in this solution should be less than 48 hours and should be transferred to alcohol. 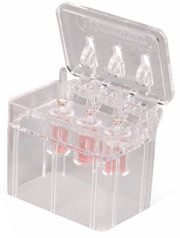 Packaged in leak-proof histo-containers, prefilled and ready-to-use. Reagent Supplied: Ready to use buffer. Chromic Acid, Reagent, Crystals, A.C.S. These clearing solvents offer Histology and Cytology laboratories a safer alternative to xylene. RDO and RDO Gold were developed with the basic premise of making your work routine quicker and easier without sacraficing the quality and integrity of your samples. 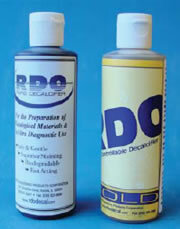 RDO and RDO Gold are remarkably effective multipurpose decacifiers that can be tailored to suit your specific lab routine. Bouin's Fluid in Pre-filled cups. For some tissues, the use of formalin (contains 10-15% Methanol) is not suitable, we offer the alternative formaldehyde (prepared from paraformaldehyde – contains no methanol) for your convenience. Buffered with phosphate in accordance with the A.f.I.P. manual of Histology. Filtered and ready-to-use. Karnovsky's Fixative Kit, please click here. After glutaraldehyde has been purified to EM grade, it has a high risk of polymerizing if it is not handled properly. Electron Microscopy Sciences takes special precautions to assure a polymer-free, pure glutaraldehyde. Every lot of our EM grade aqueous glutaraldehyde is assayed prior to shipping assuring you consistent purity and the highest possible quality. If stored properly, our Glutaraldehyde has a very long shelf life. We package our aqueous glutaraldehyde in 10 ml, single dose ampoules, sealed under dry nitrogen, and kept refrigerated until it is shipped. We offer our glutaraldehyde in a wide range of percentages to simplify mixing procedures and avoiding waste. EM grade aqueous glutaraldehyde, stored in volumes greater than 100 ml, with repeated defrosting and recapping, will polymerize in time, producing an absorption peak of 235nm rather than the 280nm of pure EM grade. The presence of polymerized glutaraldehyde greatly reduces its efficiency as a cross-linking agent, preventing proper fixation. For this reason, we provide 10 ml ampoules and 100 ml bottle quantities for larger applications. Over the years, many of our valued customers have requested purchasing our aqueous Glutaraldehyde in serum vials. This packaging allows the user to puncture the special non-reactive seal with a hypodermic syringe and draw out the exact quantity of aqueous Glutaraldehyde needed without opening the container. This packaging assures freshness and purity of the aqueous Glutaraldehyde at all times. 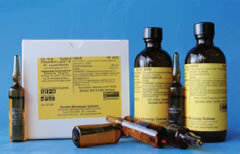 * All other concentrations are available in serum vials upon request. For any special concentration, or packaging requirements other than those already listed, please call us today. We will manufacture in accordance to your specifications. * John M. Robinson and Morris J. Karnovsky, 1991. "Rapid-freezing Cytochemistry: Preservation of Tubular Lysosomes and Enzyme Activity". J. of Histochem., Cytochem. Vol. 39, No. 6, pp 787-792. We would be pleased to fill your specific glutaraldehyde needs. Please call for prices on special concentrations or size requirements. Karnovsky's with paraformaldehyde solution and EM grade glutaraldehyde. 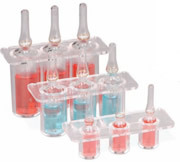 Includes 4 inserts to allow opening of 1ml, 2ml, 5ml and 10 ml ampules. Transparency allows unobstructed viewing of ampule contents at all times. Mirsky's Fixative™ is a superior fixing agent for use in immunohistological and immunological protocols. Mirsky's contains no formaldehyde or glutaraldehyde. Therefore, it has considerably reduced toxicity and virtually no odor. Mirsky's Fixative is neutral, buffered, and isotonic (308 mOsmol). Additionally, Mirsky's Fixative does not contain toxic or hazardous buffers such as cacodylate or barbital. Hardening or shrinkage of tissue is considerably reduced. Double reactive sites afford excellent cross-linking properties while maintaining sample enzyme activity. Samples processed in Mirsky's Fixative for light microscopy can subsequently be used in electron microscopy procedures. Special buffer systems may be used in place of the buffer provided. Use as replacement for formalin and/or glutaraldehyde fixatives in immunohistological and immnocytological staining protocols. Tissue size is unlimited, as long as the sample is no thicker than 0.5cm in at least one plane to assure uniformity of tissue penetration. The gross visual appearance will be different than in formaldehyde and tissue may seem "raw". This is due to double site binding of the fixative with a resultant reduction in tissue shrinkage. Microscopic examination of tissue morphology will be noticeably improved. This material is intended to maintain enzyme and antibody activity. For best results, tissue section of high digestive enzyme content should be thoroughly rinsed in saline solution before fixation (e.g. trypsin in intestinal samples). Once fixed, tissue may be retained in Mirsky's Fixative and ethanol indefinitely. Mirsky's Fixative is normally distributed as a concentrated two bottle system, although high through-put laboratories often use the single bottle ready-to-use format. The two bottle system is comprised of Mirsky's Fixative 10X Concentrated and Mirsky's Fixative 10X Buffer. To reconstitute to working strength, add 1 part Mirsky's Fixative 10X Buffer to 8 parts distilled or deionized water, mix thoroughly, then add 1 part Mirsky's Fixative 10X Concentrate and mix again. The two bottle system has a shelf life of 12 months while the ready-to-use format has a shel life of 30 days. A highly purified gold compound for the preparation of Colloidal Gold sols. Preweighed to facilitate your work. (Preparation instructions for Gold Sols included).